Charleston, SC (Law Firm Newswire) September 18, 2018 – Steinberg Law Firm announces its expansion into the area of construction law, representing homeowners and property owners’ associations seeking compensation for defective construction. Construction defects are any problems in a building that should not be there. A construction defect is any part of a building that does not meet building standards that it is required to comply with. Under South Carolina law, everyone who worked on or developed a home was required to construct a domicile that is habitable and required to perform their work following the building code and industry standards. If a home is leaking, falling apart or has other issues, it likely does not meet these standards. Construction defects cause property damage that lowers the value of a home or condo, reduces the useful life of the building, and in some cases, are safety and health hazards to the people living in and around the building. Some construction defects are immediately observable whereas others are not noticeable until years after the home was completed. For example, defects can be hidden inside the walls, foundation or roof and not noticeable until the defect causes damages in other parts of the house. Determining the full extent of construction defects in a building and the legal remedies for addressing those defects usually requires an experienced construction lawyer assisted by an expert engineer or architect. The addition of the practice area coincides with the arrival of the firm’s newest associate, Elliotte Quinn, an accomplished construction lawyer who uses his knowledge from previously defending several of the largest national homebuilders to help homeowners with construction defect claims. Construction problems present complex issues, both legal and technical construction issues. It is difficult for a homeowner without a lawyer to have a fair shot when trying to get a builder to fix or pay for a problem in a home. The big homebuilders have teams of lawyers, construction professionals who understand the technical details, and architects and engineers who regularly provide them with expert opinions. Having a lawyer on the homeowner’s side levels the playing field and makes it possible for the homeowner to get everything deserved as compensation for the builder’s mistakes. 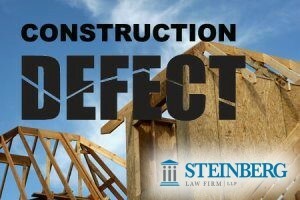 Our construction defect team at Steinberg Law Firm is passionate about defending the rights of homeowners, and we know what it takes to bring an effective case to recover damages for building defects. The initial consultation is completely confidential and at no cost. The team of lawyers at Steinberg Law Firm have a long history of using their knowledge and experience to help people with construction defects, workers’ compensation, auto accident, wrongful death, social security, personal injury and medical malpractice cases. Call 843-720-2800 for a free consultation.